It would be wonderful to discover a genuine narrative of day-to-day activity in Erivan post office during 1920. My guess is that it was essentially a philatelic bureau and that over 90% of all stamps overprinted in the post office were sold to people about to leave Armenia who cashed in their (worthless) Armenian banknotes against postage stamps which in Constantinople, Paris or Berlin could be exchanged for hard currency. I guess there were also a few dealers and speculators who came from Tiflis or Batum or Baku, shopped and left. There should have been no problem paying the salaries of the post office clerks. In the second half of 1920, the post office began surcharging stamps previously overprinted with framed or unframed Z, at a rate which increased the face value of the stamps by a minimum of 100 times for kopeck values ( 1 kopeck stamps surcharged 1 rouble and so on) and a minimum of 10 times for rouble stamps (10 rouble becoming 100 roubles). This made financial sense but the sensible move came rather late. Customers at the philatelic counter had already bought most of the stamps originally overprinted with framed Z handstamps, especially the bargain price low values which even when they were overprinted had no postal usefulness - tariffs were already at a minimum of 60 kopecks. More sheets of the stamps with unframed Zs, overprinted later than the framed Zs, remained. In the Michel catalogue, combined surcharges on framed Z stamps are listed as Michel 86 - 101; combined surcharges on unframed Z stamps then follow as 102 - 118. My 2006 Michel makes no distinction in the pricing - the stamps are given the same values simply according to the face values of the stamps. This is a mistake; the framed Z stamps are much, much scarcer. How much scarcer? Last year I bought Peter Ashford's collection of Combined Surcharges - that's the Ashford of Tchilingirian and Ashford. Today I was looking at the collection and counted 310 stamps. Of those just 32 had framed Z overprints - say 10%. Since Ashford would have been looking to represent as many types as possible, 10 % almost certainly over estimates the proportion of framed Zs among Combined Surcharges. In addition, Combined Surcharges on Imperial kopeck value stamps with a face value below 15 kopecks are extremely rare - there were no longer the basic stamps in stock to use for the second surcharge. It is only when you get to 25, 35 and 50 kopecks that you begin to see framed Zs. 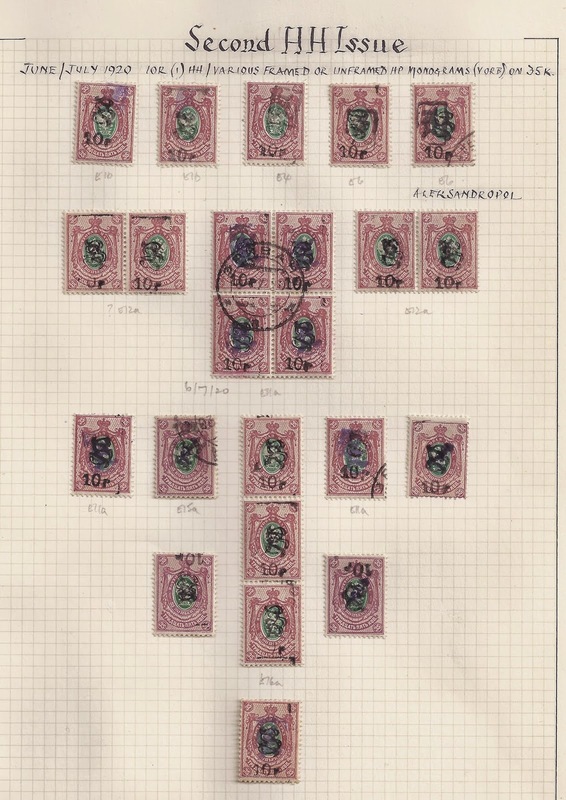 Here, for example, is Ashford's page of 35 kopeck stamps surcharged 10 roubles. The five stamps in the top row have framed Zs (Ashford classifies them as E1b, E1b, E4, E6, E6), the rest of the page shows examples of unframed Zs.